Standing at the entrance of St. Thomas — a large neo-Gothic building — is a cheerful man. Children wave to him on their way into catechism classes. Men, in slacks and dress shirts, and women, some dressed no differently from American women and many others wearing silk, satin and chiffon saris, greet him with smiles and handshakes. “Good morning, Father. How are you?” they ask. Father Jos Kandathikudy and the people greeting him made all the contributions that transformed the unused St. Valentine’s Roman Catholic Church into St. Thomas Church. The church was donated to the community by the Archbishop of New York, Edward Cardinal Egan. In the eight years since his superiors in Kerala asked him to organize Syro-Malabar communities in the eastern U.S., Father Kandathikudy has established 21 missions. St. Thomas was founded as a parish last year and is the headquarters for Syro-Malabar Catholics in the New York area. Read more about “New World Children of St. Thomas” in the May-June 2003 edition of the magazine. Egyptian Christians — known as Copts, a derivative of the Greek word Aigyptios, meaning Egyptian — are proud of their ancient roots. They received the Gospel from St. Mark the Evangelist, who brought the faith to the city of Alexandria, second only to Rome in the ancient Mediterranean world. There, he died a martyr’s death around the year 67. The evangelist extended his activity beyond the city’s prosperous Jewish community. He called for the city’s populace, mainly Copts and Greeks, to adopt “the way,” the early Christian description for discipleship in Jesus Christ. Mark sowed the Christian seed on fertile ground. Centuries before the Arab advent in the eastern Mediterranean, and with it the rise of Islam, Egyptian Christianity blossomed. It provided the church with the philosophical foundation and theological vocabulary responsible for its explosive expansion in the Greco-Roman world, introduced monastic life and peopled the universal church with some of its greatest saints and scholars, including Pantaenus, Clement, Origen, Anthony, Macarius, Didymus, Athanasius, Arius, Cyril and Dioscorus. The Copts today form the largest Christian community in the Middle East. Embracing an estimated 10 percent of Egypt’s population of 88.5 million, the Copts belong to three groups. The majority belongs to the Coptic Orthodox Church. This church developed independently, breaking communion with the churches of Rome and Constantinople, after the Council of Chalcedon (451) attempted to solve the Christological clashes of the early church. Despite centuries of relative isolation and on-again off-again discrimination or persecution, the Coptic Orthodox Church is experiencing a revival. Throughout the 18th and 19th centuries, European and North American missionaries — Catholic and reformed — competed for influence among the Orthodox Copts, especially after their evangelical efforts among Muslims failed. The goals of these missionaries — to educate the largely illiterate laity, bolster the formation of the clergy and work for the reunion of the churches — were well intended. But their efforts splintered the Coptic Orthodox Church, eventually forming Coptic Catholic and Coptic Evangelical communities. In the first decades after Vatican II, the Coptic Catholic Church grew considerably. Much of this growth may be attributed to the many social service activities of the Coptic and Roman (Latin-rite) Catholic churches. These include schools (more than 100 parishes sponsor primary and secondary schools), orphanages, clinics and medical dispensaries. Most of these institutions are located in the poorest and remotest villages of the Nile Valley, which remains the center of Coptic Catholic life. And while for decades relations between the Coptic Orthodox and Coptic Catholic churches had been frosty, the rise of militant Islam and its violent targeting of all Christians has now united all Copts, highlighting what they hold in common: their faith in Christ. 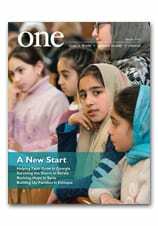 Click here for more on the Coptic Catholic Church from the pages of ONE magazine. I must admit that I had certain preconceptions and received images that crossed my mind as I passed over the threshold of the Holy Family Orphanage in Ain Kawa, Erbil, a recently-opened home for children in need run by the Dominican Sisters of Saint Catherine of Siena to cater to the needs of Christians displaced by ISIS last August. In the village I grew up in in the Irish midlands, there was a house known as “the orphanage” where kids from various backgrounds were taken care of by a mixture of nuns and state-employed social workers. The children in this home were of various ages and so were in various classes of the village’s primary and high schools. They were cloaked in a sort of childhood mystery. Who are they really? Who are their real parents? Do they really feel like brothers and sisters? What is it like to have so many “parents?” There was also a sort of sadness, I remember, that we projected on them: a supposition that to be brought up by anyone but your biological parents can be nothing but a tragedy. So this was the sort of vague, unprocessed baggage that brought with me as I crossed the threshold of the orphanage in Ain Kawa But from that moment, I was constantly surprised and enlightened. The Erbil orphanage reminded me not of the orphanage in my long-ago childhood village but rather it reminded me of my own childhood home and upbringing. Again and again. The children in the orphanage: Sally (20), Rita (16), Mariam (13) and Thikra (10) had an age-spread not unlike my own family’s. And while my family consists of six siblings and theirs of four, I could immediately relate to the dynamics among the children: it is recognizable to anyone from a big family: alliances exist between various siblings, chores are shared out and one helps or hinders the other, there is a chain of surrogate care from the youngest to the eldest where gaps in over-stretched parental care are compensated for in an organic and spontaneous way. That said, while I was struck by all the similarities between my childhood and those of the girls at the Holy Family Orphanage in Ain Kawa, it became clear during my interviews that there were some deep, indelible facts in their lives that make it such that I could never know their experience fully. Only one of the four girls is a “true orphan,” in that both of her parents have passed away. All the rest of the girls still have one parent alive, for example or are from broken homes or from families who are incapable of minding them and so were placed in the care of the nuns. That is to say that these girls once knew what it was to have biological family and to belong to a family bound by blood and not by various family misfortunes. The parallels, I eventually realized, only go so far. The displacement of the Christians of the Nineveh Plain by ISIS in August 2014 constituted a second displacement for these girls: the first being the one from their biological families. That said, the displaced girls of this orphanage have come to find themselves in perhaps the best possible circumstance of refuge. While other families are reduced to sharing rooms with other families, while domestic problems flourish across the displaced community, while children exhibit behaviors concurrent with symptoms of trauma, the girls of the Holy Family Orphanage in Ain Kawa have found themselves consistently swaddled in the love and comfort of the two nuns who take direct care of them and of the larger family of some 40 Dominican Sisters in the convent just at the end of their street. Read more in “Grace” from the Summer 2015 edition of ONE. And check out this profile of the Holy Family Orphanage in the same issue. To support the Dominican Sisters and their work with displaced families in Iraq, please visit our giving page. Seven Ukrainian servicemen killed, 13 wounded (Reuters) Seven Ukrainian servicemen have been killed and 13 wounded in fighting with pro-Russian separatists in the past 24 hours, military spokesman Oleksander Motuzyanyk said on Thursday. The casualties were the highest daily losses for the Ukrainian army since mid-July, as violence continues to test a six-month-old ceasefire deal. On 20 August, Israeli heavy equipment loads an olive tree after it was uprooted to make way for the controversial separation barrier in the Cremisan Valley in Beit Jala, West Bank. The latest developments in the Cremisan Valley — with Israel moving forward with construction of a controversial barrier that will divide the region — has prompted a response from the United States Conference of Catholic Bishops (U.S.C.C.B.). “On Monday morning, 17 August, Israeli bulldozers arrived unannounced on private properties in Beir Ona, near the Cremisan Valley, to resume construction of the Separation Wall. The residents of the area were surprised and felt the pain of the loss of about 50 of their centuries-old olive trees that were uprooted. The Latin Patriarchate of Jerusalem strongly condemns this Israeli conducted operation, which is without regard to the rights of the families of the valley; the rights that these same families have bravely tried to defend before the law over the past decade. We join with the sorrow and frustration of these oppressed families, and we strongly condemn the injustice done to them. The construction of the Separation Wall and the confiscation of lands of the local families are threats and insults to peace. We call on the Israeli authorities to await the decision on the petition submitted by the families of the Valley to the Supreme Court of Israel a few days ago and to stop the work that has been started. We urge you to press Israeli authorities to stop the work on the Separation Wall whose route is confiscating the private lands of Palestinian families in the West Bank. Such actions undermine the cause of peace and impair the possibility of a two-state solution.